If you are shooting in a different aspect ratio than the expected final output, place an Aspect Guide on your page for framing your shots instead of just using gaffer tape. 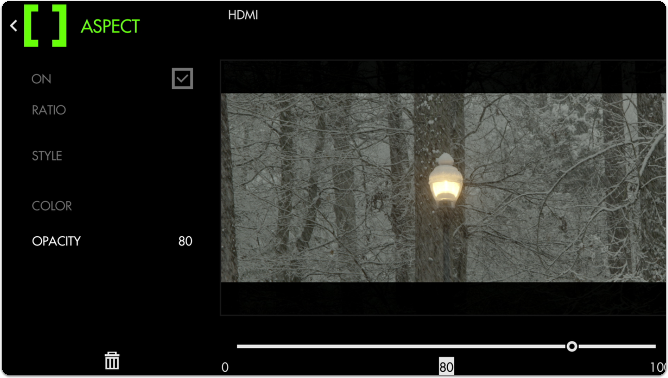 For this example we will be preparing for a cinemascope (2.39:1) aspect ratio while filming in standard 16x9. This means we wish to visualize the top and bottom of the image being cropped for the final product via Aspect Guides. 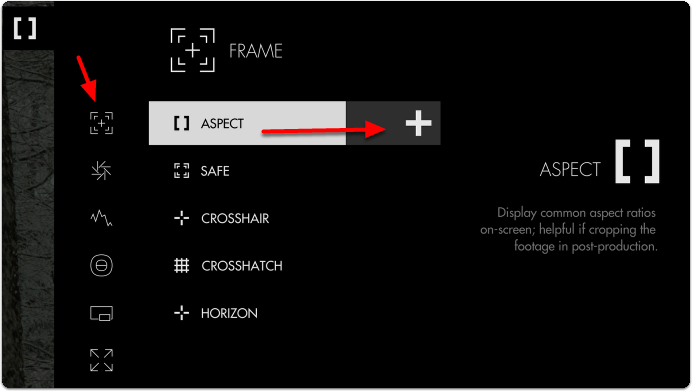 Navigate to Frame > Aspect and select the '+' to add it to the current page. Once added you can edit the settings by navigating right or tapping the right arrow when ‘Aspect’ is highlighted. The default setting is for previewing a 4:3 aspect ratio for older TVs. Select 'Ratio' and change it to 2:39 to see the black bars switch to a horizontal configuration. By default the bars are set to 50% opacity; adjust 'style' and 'opacity' to taste for whatever you find most viewable. Here I set the opacity to 80% to keep the off-screen areas from being distracting. If your production relies on boom audio, you can use the top and bottom dead zones to give your boom operator a 'grace area' for getting close-but-not-too-close. 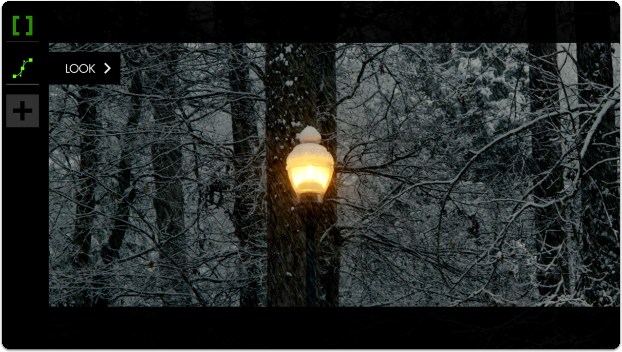 To complete our 'cinematic preview' I have applied a Look (3D LUT) - learn about Look files here. Select the aspect ratio you wish to visualize with the guide. Go with the Custom setting if using a non-standard ratio. 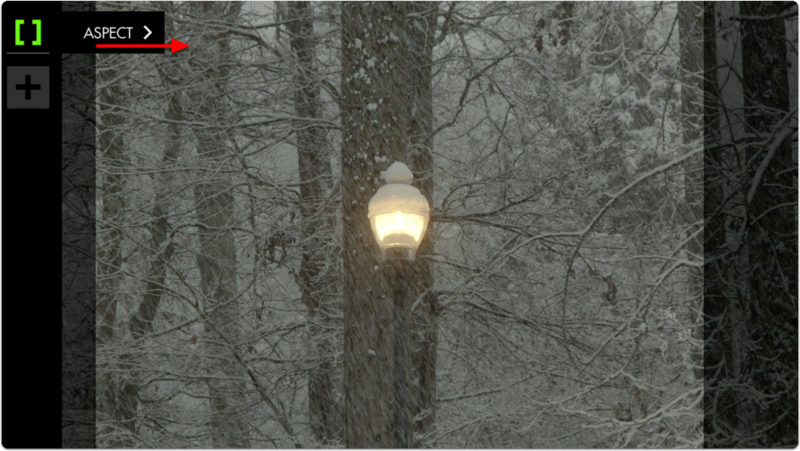 When using a custom aspect ratio, this setting manually defines the width of the crop. 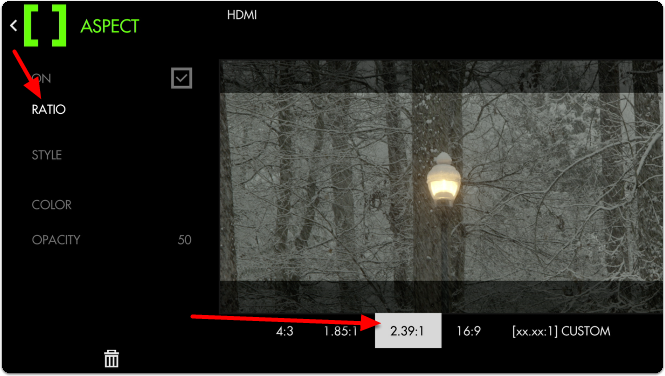 When using a custom aspect ratio, this setting manually defines the height of the preview 'crop region'. Toggles between a solid color overlay and a thin line to define the edges of the aspect ratio. Line style may be more helpful when needing to see very clearly what is outside the active area as it will not get ‘painted’ over as it does with solid color. Define the color of the overlay area if using ‘MATTE’ style or define the color of the border when using ‘LINE’ style. Adjusts the opacity/transparency of the matte area or line borders depending on the chosen Style.